Real Madrid had little trouble to get past Al-Sadd this Thursday night and got to win the match by a conclusive 5-0 result. 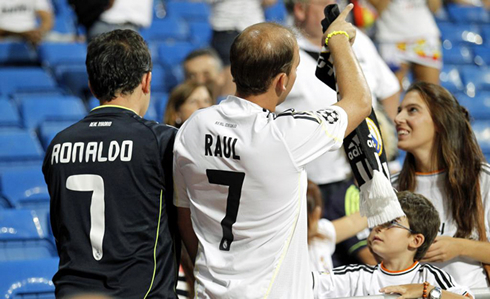 Ronaldo wore the #11 jersey for the first time in his career, after giving Raúl the right to wear the mythical #7 during the first half of the game. 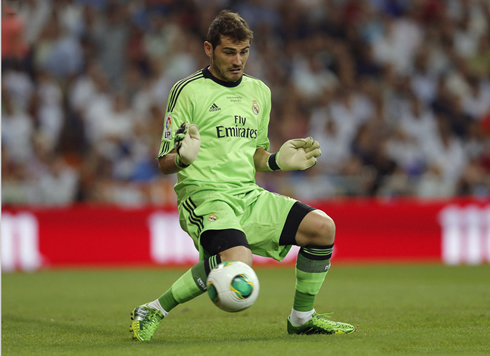 Real Madrid clinched their 9th consecutive Santiago Bernabéu trophy last night, after beating Al-Sadd by 5-0. In a game that was also meant to pay tribute to Raúl González, one of the most respectful gestures came precisely from Cristiano Ronaldo, who handed the Spanish forward the #7 jersey that he has worn for so many years during his career in Madrid. Raúl would end up scoring the opener in a first half where he actually played for Real Madrid's side and next to Cristiano Ronaldo who was wearing the #11 jersey. 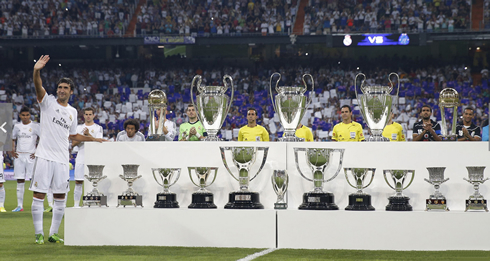 However, the real goal fest would arrive only after the break... Isco with a header, Benzema from the 12-yards mark and Jesé with a brace, all helped making sure that the trophy was staying at home and the Merengues can now start preparing their next league game against Granada, scheduled for this Monday night. It's probably important to start by pointing out that Cristiano Ronaldo won't be wearing the #11 jersey in any foreseeable future at Real Madrid. 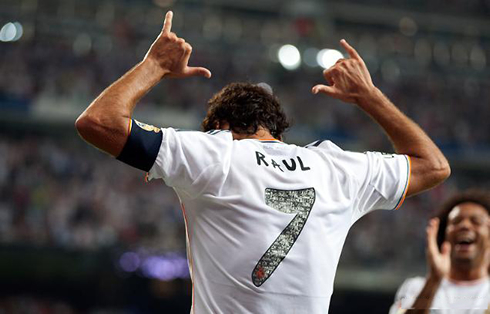 As a sign of respect to Raúl, the Portuguese forward decided to grant his Spanish friend the right to wear the magical #7 jersey this Thursday night, but the charismatic shirt will return to Ronaldo's control right next Monday, in La Liga's second fixture between Granada vs Real Madrid. 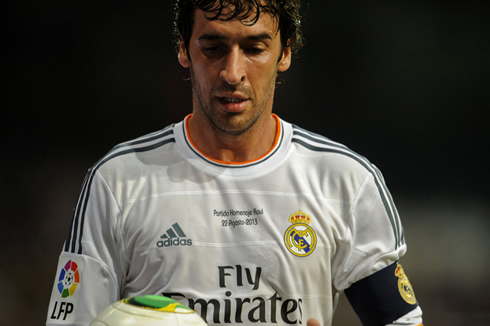 Raúl will also return to his duties with Al-Sadd and won't exactly be joining Real Madrid ranks this season, unlike what seems to be about to happen with Gareth Bale though. Most of the newspapers across the world are suggesting that Bale is about to be announced as Real Madrid's new signing over the next hours, in a world-record transfer fee of 99 million euros. Let's patiently wait for it to become official and for now, let's stick with this Thursday's night game incidents. 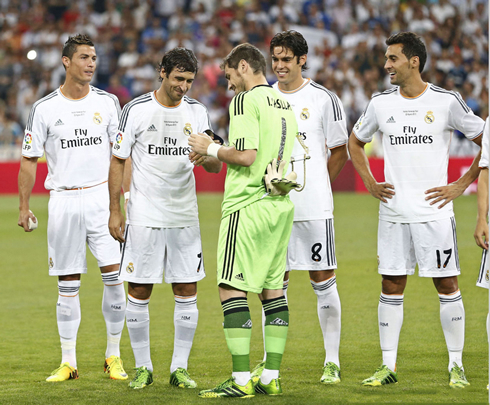 Carlo Ancelotti picked a strong line-up for this friendly match and had in Raúl González a special reinforcement for the attack. 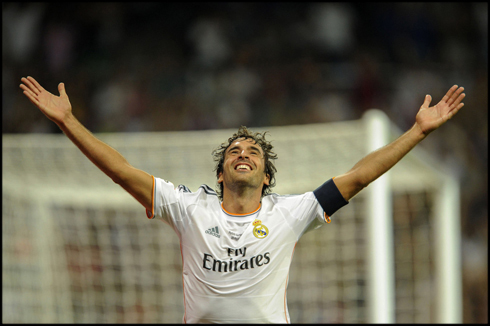 The former Real Madrid forward played for the Merengues between 1994 and 2010, but has surely felt a turmoil of emotions quite different from any other he had experienced in the past, when he stepped up to the Bernabéu pitch to play one last time for his beloved club. Kaká, Di María and Cristiano Ronaldo joined Raúl upfront and it would be the Argentinian delivering the assist for the first goal of the night, close to the 23rd minute. Di María sent over a great pass towards Raúl and the 36-year old forward proved his class is permanent when he controlled the ball magestically and struck it right away into the back of the net. No more goals got scored in the first 45 minutes and Ancelotti already had his mind set on replacing several players at half-time. 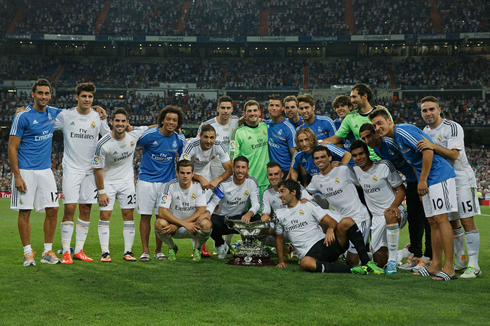 One of them was Cristiano Ronaldo, who got substituted by an invigorating Jesé Rodríguez. The Italian manager knew the most important thing last night was to avoid any injuries, as well as to give rest to some of his side key players, but he certainly wasn't counting to see the result suddenly becoming so unbalanced as he kept rotating his players. With almost 15 minutes played in the second half, Jesé left the ball over for Carvajal to run down the right wing and the right-back performed a perfect cross into the heart of the area. Waiting for the ball was Isco, who got to score the 2nd goal of his career from a header. The former Malaga midfielder is convincing even the most skeptical fans that he is worth the price that was paid for him and he keeps doing that game after game. The 3-0 was only a matter of time and it happened as we were entering the final 10 minutes of the game. Carvajal moved ahead on the pitch in another attempt to link up with his attacking teammates, but saw his intents being denied by a sliding tackle from an opponent's defender. The foul appears to have been made a few inches before the penalty-area line, but the referee pointed to the spot and Benzema didn't waste the opportunity to make it 3-0 for the Merengues. From that point onwards, Al-Sadd basically dropped their arms and everything became easier for Real Madrid to add up a few more goals to their count. The 4-0 took place just 3 minutes later, with Jesé displaying his great striking abilities by scoring from a crossed shot that he aimed to the far post. Al-Sadd's goalkeeper got surprised by the 20-year old spontaneity and when he stretched over to attempt reaching the ball it was already too late. With 88 minutes being marked on the game's clock, Mesut Ozil found Álvaro Morata with a great through-pass, leaving the Spanish forward with the last Al-Sadd defender on his back and just the goalkeeper to beat. The Spanish U21 international saw his shot being blocked by the goalkeeper's arm, but fortunately for the Merengues the rebound ended falling to Jesé, who simply sprinted ahead with the ball close to his feet and scored against an empty net. Cristiano Ronaldo next game for Real Madrid will be an away match against Granada, this next Monday (August 26, 2013). In the meantime, you can watch Granada vs Real Madrid, Aston Villa vs Liverpool, Manchester United vs Chelsea and Monaco vs Toulouse, all matches provided from our live football streaming section.